ORLANDO, Sept. 24, 2018 /PRNewswire/ -- Today at Microsoft Ignite, Nintex released research that reveals 71 percent of company decision makers find it difficult to hire for digital transformation roles. This gap is even more concerning as 38 percent of leaders also blame lack of sufficient in-house talent for their digital transformation failures. The new research, called "The State of Intelligent Process Automation Study," finds that most (71 percent) enterprises plan to hire additional staff for their digital transformation efforts. While more than half (57 percent) of companies have hired 25 or more digital transformation-specific personnel in the last year, their ability to successfully build and deploy plans is still derailed by lack of necessary talent. To address the talent gap, decision makers are specifically prioritizing hiring IT specialist (67 percent), project manager (50 percent) and consulting (46 percent) roles. IT specialists are in greatest demand likely due to the pressure to address notable IT bottlenecks, while project managers and consultants help manage transformation projects and support internal communication about digital transformation efforts. "Our latest research shows businesses are struggling to realize the vision of digitally transformed workplaces because of a shortage of skilled talent," said Nintex Chief Marketing & Strategy Officer Dustin Grosse. "While decision makers are counting on their digital transformation initiatives to deliver value to the organization, these initiatives require the right staffing, technologies and resources to deliver big results." When limited IT resources are consumed by basic tasks like tech troubleshooting and password resets, there is little time and few resources to focus on more strategic initiatives. Staff focused on digital transformation must be empowered with the know-how and process automation and management tools to make process improvements. Nintex Chief Evangelist Ryan Duguid added, "Given the talent shortage, organizations would benefit from re-imagining how they'll address digital transformation. There's no better time than now to invest in in-house talent and provide internal IT teams with the necessary training and tools to make them more effective and efficient in doing what they do best. For example, a no-code platform like Nintex gives IT professionals a set of powerful and easy-to-use process automation capabilities to quickly and securely digitize time-consuming manual processes and paper-based forms – which is a significant benefit for everyone within a business." Nintex's research also reveals that while 71 percent of IT departments have employed process automation, 34 percent of enterprise employees still want to see more automation in IT –more than in any other department. 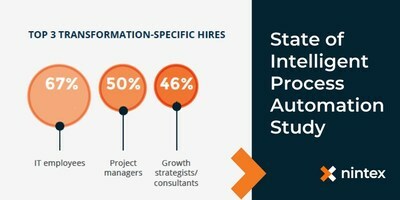 Download the State of Intelligent Process Automation ebook at www.nintex.com/stateofIPAstudy to learn more or visit the Nintex team at Booth #1814 during Microsoft Ignite, www.nintex.com/ignite2018. Nintex is the global standard for process management and automation. Today more than 8,000 public and private sector clients across 90 countries turn to the Nintex Platform to accelerate progress on their digital transformation journeys by quickly and easily managing, automating and optimizing business processes. Learn more by visiting www.nintex.com and experience how Nintex and its global partner network are shaping the future of Intelligent Process Automation (IPA). Nintex commissioned third-party research firm, Lucid, in April and May of 2018 to conduct two surveys. The first was completed by more than 450 U.S. decision makers directly involved in their organizations' digital transformation strategies at companies with 250+ employees and work in either manufacturing, healthcare or finance in an operations, IT or marketing role. The second surveyed 650 U.S. line of business employees at U.S. companies with 250+ employees.